A private agency that expedites the authentication, legalization, and certification of documents. Our services include: Document authentication, certification and legalization. I have a company document that has only been notarized from a notary public. I have a document certified from the US Department of State in Washington DC. I have a commercial document (C/O or C/I). Officially the People's Democratic Republic of Algeria, is a country located in North Africa. In terms of land area, it is the largest country on the Mediterranean Sea, the second largest on the African continent after Sudan, and the eleventh-largest country in the world. Algeria is bordered by Tunisia in the northeast, Libya in the east, Niger in the southeast, Mali and Mauritania in the southwest, a few kilometers of the Moroccan-controlled Western Sahara in the southwest, Morocco in the west and northwest, and the Mediterranean Sea in the north. Its size is almost 2,400,000 km2, and it has an estimated population of about 35,700,000 as of January 2010. 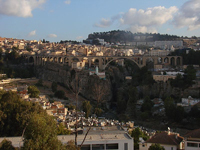 The capital of Algeria is Algiers.